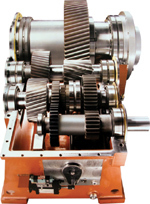 Hobbed Gears — no other method provides the accuracy and repeatability of hobbing. Precision Ground Worms — efficiency and dependability are increased by precise, skilled craftsmanship, and superior quality control. Conservative Bearing Ratings — Bearing ratings exceed industry standards increasing durability. Generously Proportioned Shafts — Increased shaft diameter provides accurate and reliable support. 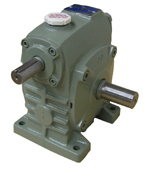 Heavy Duty Housings — Rigid housings protect gear sets under load, increasing longevity. Integral Worm and Input Shaft — Precision cut, induction hardened, and precision ground for smooth operation and long life cycle. Four Bearing Design Standard — Maintains proper gear mesh and alignment (except some hollow shaft sizes). Alloy Bronze Gear — Chill cast bronze for increases strength and durability. Internally Cast Chevron — On sidewalls of Worm Top styles to direct oil to bearings, improving bearing lubrication and seal life. Cast Iron Housing Body— Resists corrosion. The one-piece case is strong and compact. Painted Housing Interior — Seals against corrosion, prevents contamination from casting. 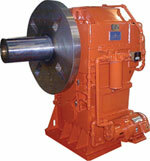 Single reduction from 5:1 to 70:1 – fractional HP up to 50 HP. Output Torque – 200 in-lbs to 52,000 in-lbs. Five Ratios Available — 1.5:1, 2:1, 3:1, 4:1, and 5:1. Rugged Cast Iron Housings — Strong and compact. Supplied Without Oil as Standard— Oil filled upon request. Up to 14.21 hp and 1077 in-lbs output torque. PCentrifugally cast to ensure increased resistance to wear and fatigue pitting for maximum efficiency. Provide maximum thread strength and resistance to wear without sacrificing advantages of a medium hard. Precision ground threads to optimize power transmission capability. 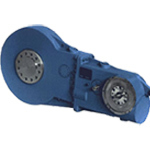 Quality cast iron provides maximum strength and heat dissipation while maintaining accurate gear alignment. Fabricated Steel where require to meet operational requirements. Designed to withstand higher torsional and overhung loads. Provide greater rigidity to accomodate radial, thrust, and overhung trails. Ratios from 5:1 to 60:1. Input Horsepower from 3.4-211 HP. 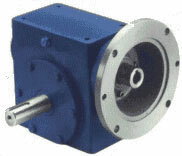 Available in solid and hollow output shaft arrangements. Horizontal and Vertical mounting Feet available. Type 12 & 16 – Hollowoutput shafts. Fan Cooling — Fan size and design permit a smooth, effective flow of air beneath, above, and around all sides of the reducer. Rugged Finned Housings — Housings of higher quality cast iron are ribbed for maximum strength and heat dissipation. Increased Oil Capacity — A built-in lubrication system decreases oxidation rate and increases lubricant life. Centrifugally Cast Bronze Gears — Ensure increased resistance to wear and fatigue pitting. Flamatic-Hardened Worms — Maximum thread stregth and resistance to wear. 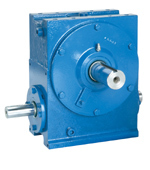 Large Gear Shaft Diameters — Withstand torsional and overhung loads. Generously Size Bearings — Provide greater rigidity to accommodate radial, thrust, and overhung loads. 3″ to 12″ Center Distances. Ratios from 3-1/9:1 to 95:1. Up to 170 input horsepower. 4″ to 12″ Center Distances. Ratios from 32:1 to 394:1. Up to 60 input horsepower. Output torque up to 145,000 in-lb. Ratios from 25:1 to 6650:1. Output Torque up to 145,000. Center distancecombinations 3″ to 6″ primary reducer and 3″ to 12″ secondary reduce. 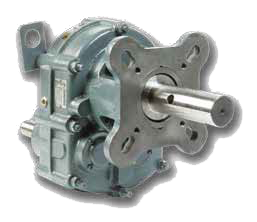 RFD – Vertically Down Output Shaft Configuration. Helical Gearing — Carburized, case hardened, and ground. Alloy Steel Shafts — Hardened and ground gear seats and bearing/seal journals maximize durability and extend operating life. Double Lip Spring Loaded Shaft Seals — Prevent oil leakage in harsh operating environments. 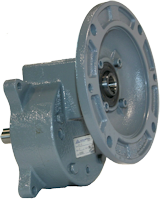 Oversized Bearings — Ensure long and reliable service life in severe duty applications. Input hp from 1/3 to 125. Output Shafts and Screw Adapter Conveyor Kits available.